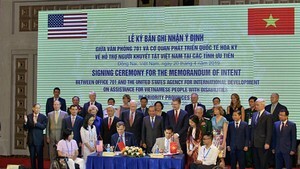 High-ranking Vietnamese officials are currently visiting with their Cuban counterparts as part of a trip to attend the 14th Non-Aligned Movement (NAM) Summit. The meetings have been warm and friendly as the two countries’ relations have never been better. After arriving in Havana, Cuba on Wednesday for the NAM summit scheduled for today and tomorrow, President Triet met with Cuban Vice President Raul Castro Ruz. On behalf of the Cuba’s party, government and people, Mr. Raul Castro warmly welcomed the Vietnamese President and congratulated him on his election as the Vietnamese State leader. The Cuban Vice President stated that Cuba has always respected the friendship, solidarity and cooperation between the two parties, governments and peoples. President Triet expressed his pleasure at the fact that Cuba has overcome the many difficulties and challenges of its past in order to win the admiration of the international community. 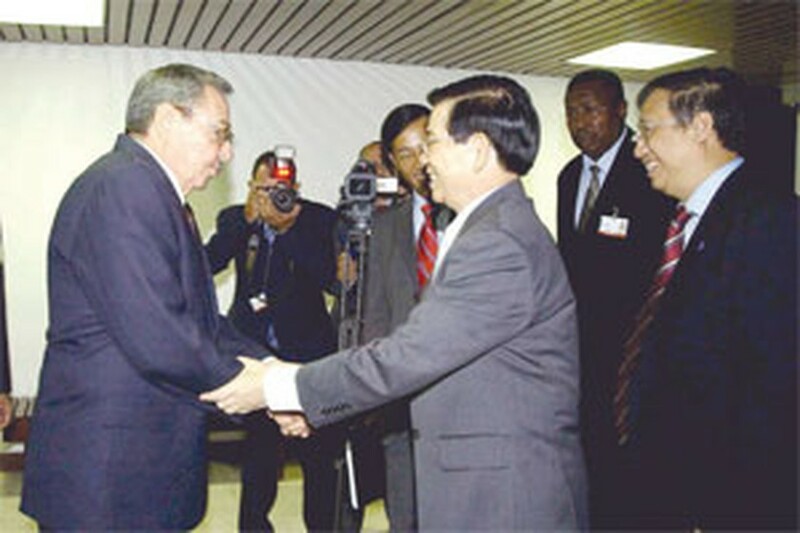 He relayed regards from Vietnamese Party General Secretary Nong Duc Manh to President Fidel and expressed the support of the Vietnamese Party to the government and people for Cuba. On this occasion, President Triet presented as a token gift of 600 computers and 300 printers to the Cuban Government. In his speech delivered at the opening ceremony of the NAM ministerial meeting earlier the same day, Deputy PM Pham Gia Khiem mentioned opportunities and challenges facing developing countries in the current globalization climate. He emphasized the need to consolidate solidarity among NAM members to remain independent and sovereign while struggling against poverty, unilateralism, terrorism and race discrimination. Deputy PM Khiem also voiced his support for Cuba at his meeting with Cuban Foreign Minister Felipe Perez Roque in Havana on Wednesday. He said Viet Nam appreciates Cuba’s initiatives to strengthen the NAM movement and enhance cooperation between NAM member countries. The 14th NAM summit, attended by representatives from 115 member countries, will approve many important documents that demonstrate members’ determination and efforts to maintain NAM principles and goals. The group’s main tenets are national independence, sovereignty, peace, solidarity and cooperation for development, anti-war, counter-terrorism and non-proliferation of nuclear weapons.